This story is about Captain Jack Sparrow embarks on an adventure to find the fabled Fountain of Youth. But, he faces alot enemies on his jounery, but they need him because he is really brilliant. I like the funny action about he always escaped from his enemies! He is pirate but, he don't like to involved in the wars or politic. He always good at fighting with used his sword, in the adittion he always think his own plans so quickly while he faces the "serious" problem between him and his enemies. If you are pirate, you must cheat the people and like to kill people when you steal the things. 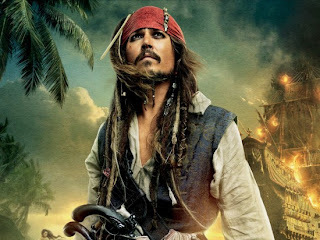 It is very scary but, Jack Sparrow never do this because he is very clever to cheat people only as his most skill that he adores. He really don't like to fight so much. He always escapes from the trouble! Some enemies think Jack Sparrow afraid, but no, he always fight for his pride or must take what he desires no matter! In the previous movie, there are the romantic pairing of Orlando Bloom and Keira Knightley only. In this story, Angelica is very clever to cheat people. She wants to use the people as she likes... I really not sure if she is in love with Jack Sparrow or not... But, Jack really save Angelica at end! This is what I think so. I surprised when I see the scene about the mermaids attack human?! I know about the mermaids are singing to attract the men only in a legend... But, the romantic between a mermaid and missionary are okay. Who know what will be happen to both after they swim into deeply? Also, there are three conflicts which get Jack Sparrow involved in! So not easy for him to escape from... Angelica, Blackbeard Captain Barbossa forced Jack Sparrow to find the Fountain of Youth. Then, they explored the sea and land, like the Indiana Jones I remembered about the previous sea, they always fighting in the wars while their ship are on sea only. After that, Jack Sparrow really need his ship. He is very happy if he gets Black Pearl ship! I feel Jack Sparrow will continue to explore again if he wants! My mom really love to watch this movie!